NUS Geog Soc: Geog Soc Sports Day 2013! Geog Soc Sports Day 2013! The annual Geography Sports Day is here again! 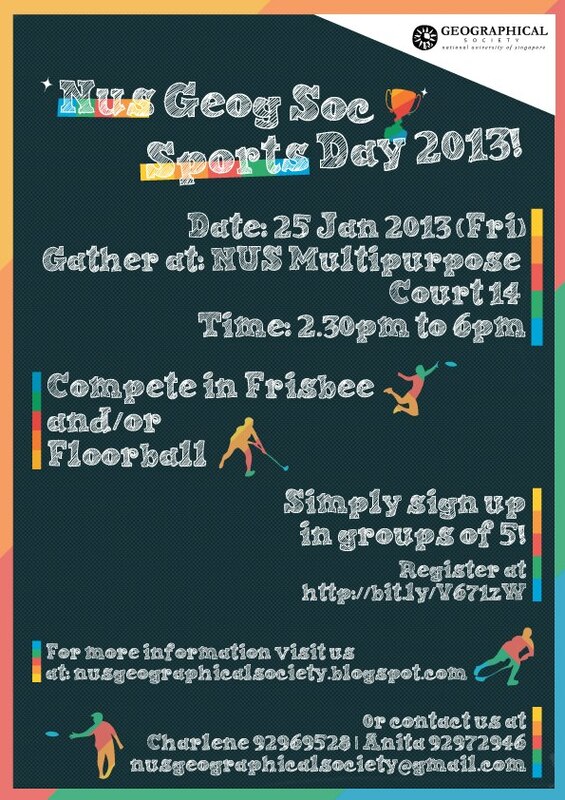 Join us for some fun as we play floorball and frisbee to keep ourselves fit and healthy and stay bonded as a family! Do sign up with us with a team of 5, with a maximum of 3 guys per team! We look forward to seeing you at Sports Day 2013! [UPDATE] The gathering point has been changed to Multipurpose Sports Hall 6. [UPDATE 2] The gathering point has been reverted back to Multipurpose Court 14, sorry for the inconvenience caused!